Really? In Duluth? – "Most Likely to Succeed"
I was having fun reading a book for upper elementary students on the great state of Minnesota. Having been born and raised here, and spending quite a bit of time studying the state’s history in 4th grade, I believe, most of it was familiar. But it was fun to see things through older eyes, and there were certain facets that were new to me. I had known that the iron mining in Minnesota is important to the country, but I hadn’t realized that we have been the top iron mining state for the past 100 years. Though, this book was written almost 10 years ago, and the iron mining in the state has not been doing well for decades, so that may no longer be true. There was one total surprise in the section on Duluth. The author talked about the “incredible engineering contraption called the Aerial Lift Bridge.” It is a fun bridge to watch. There are at least two such bridges in Minnesota. The other one that I know of is over the St. Croix river at Stillwater. 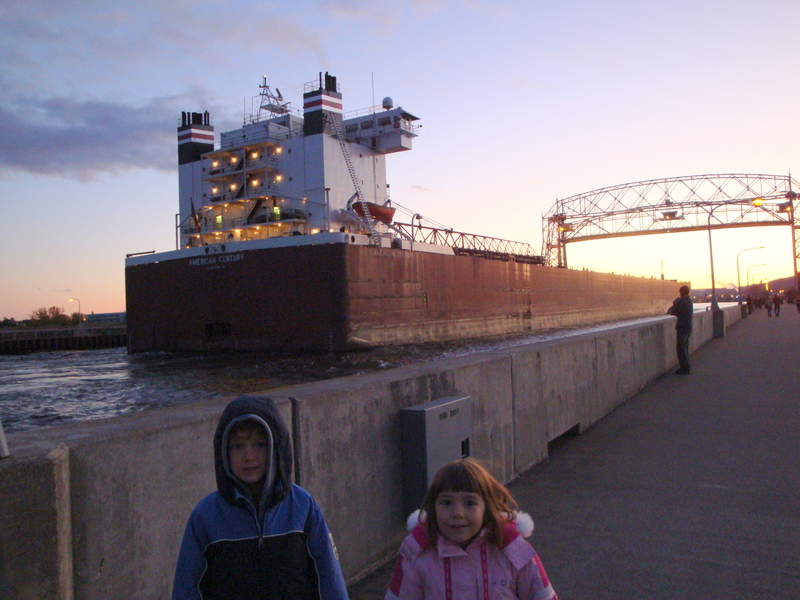 He then goes on to write: “[the lift bridge] has a large steel deck that lifts boats into a narrow canal that connects to Lake Superior.” Now that would be something to see – a 1,00 foot boat being lifted from the lake and placed into a narrow canal. I don’t think I could watch! The bridge does not pick up boats but lifts to let boats pass under it. It is quite impressive to see huge ocean-going vessels slipping through the canal with what seems to be barely more than 20 feet to spare on either side. I would never be able pull it off. I tend to succumb to the “Fraiser-effect” – being pulled into stationary objects rather than being able to steer past them, especially when there are two stationary objects close together that must be passed between! And watching the boats pass under the bridge, holding your breath as their antennae, seem to graze the deck is quite exciting. But I fear that people will be a bit disapppointed, should they be expecting the other. Having done writing for a living b.k. (before kids), I sure understand how errors can occur, no matter how hard a team works on a piece of writing. I am guessing it was probably some silly typographical error, but sure does change what happens in Duluth! Next Next post: I have no clue!